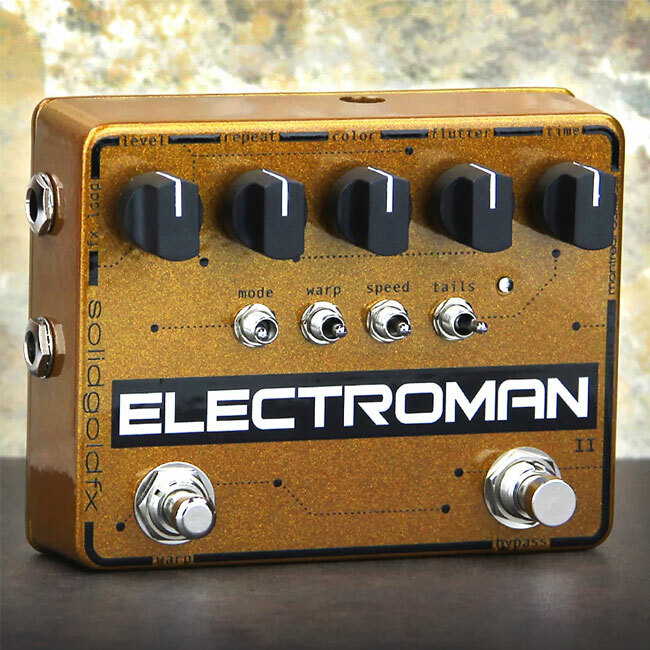 When SolidGoldFX released the original Electroman delay a few years ago, it stood out from the pack of digital delays because of a few unique features. Those included the Warp Switch, which sends the pedal into self-oscillation when the repeats are set above 10 o'clock and acts as a delay kill-switch with the repeats set below 10 o'clock. SolidGoldFX carries this popular feature over to the Electroman MKII, but improves it by adding three sensitivity controls so that users can choose how dramatic the resulting effect will be. Another favorite feature carried over from the first generation of the Electroman is the fx loop. The MKII features a stereo Y-cable jack, allowing users to connect as many auxiliary effects pedals as they like to be applied to the repeats. The repeats are also controllable via three selectable speed ranges and a flutter control, which increases the depth of the repeats as you roll it up and can get you into tape-echo simulation range. The MKII also offers buffered bypass with a tails switch that allows players to decide whether to cut off the repeats when the pedal is off or let them trail into your amp even when bypassed. Check out the video above to watch a more in-depth demonstration of what this new pedal can do. From now until midnight on Valentine's Day (February 14), you can buy your own SolidGoldFX Electroman MKII exclusively on Reverb for 15% off. Click here or the banner below to take advantage before time runs out.